Buying a pool ladder is an important decision and not only means an easy way to get in and out of your backyard pool, but a safe way for everyone. Pool packages may or may not come with a standard A-frame ladder, but this type may not suit your needs. If you built a deck around the pool, or have elderly family members that need more help getting in and out of the water, you need to purchase the best above ground pool ladder. We've reviewed our top picks for ladders and steps so you can easily decide on the right ladder for your summer swimming activities! Confer Staircase Style Above Ground Pool Steps fit perfectly in pools that are 48 to 52 inches high and with decks up to 60 inches high. These steps act as a ladder and assemble with snap-together pieces and instructions. The steps are 31 inches wide and 32 inches deep making it safe and comfortable to go in and out of the water. The plastic material will withstand the suns UV rays from damage and the unit is filled with sand or pea gravel for stability. 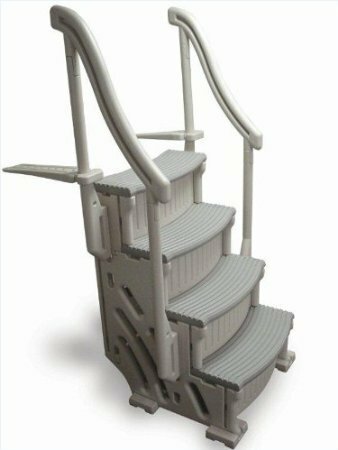 The handrails provide support and these steps can hold up to 400 pounds of weight. The gray color will go with any pool décor and we love the sturdiness of these well-made steps! Stylish and supportive, this Confer Above Ground Pool Curved Steps allows for safe pool entry and a place to sit. The ribbed surfaced steps are curved and have an elegant look. Sweeping handrails are steady to assist anyone who needs help getting into the pool and with the two-tone gray and taupe colored plastic, safety meets fashion! There are 4 steps and a base that that can be adjusted for uneven ground under the liner. As with the other Confer products, these steps are made from UV resistant plastic and won't fade or crack. No tools are needed for assembly and the deck mounting brackets are a wide 24 inches! Bottom plugs for the inside sand for weighting can come loose and cause sand to gather on pool bottom. Another Confer well-built pool ladder, this 7200 model sits above the pool wall and works fine with 52" high pools. Will not tear your pool liner and is great for pools without a deck. This ladder can be used with soft-walled pools and includes a locking feature. It's simple to operate and ensures children cannot get into the pool without an adult present. Confer includes a high-quality padlock with keys for the latch on the roll guard. Definitely a great choice when you have small children around the pool. Some customers felt like this A-frame ladder wasn't sturdy enough. This Confer 6000B includes a deck platform and the steps have flat treading for easier climbing. The steps have an anti-entrapment barrier; a safety feature to prevent children from getting stuck under the steps. The unit is white plastic with gray side rails that helps this ladder become more visible. The steps are each 18" long by 5" wide and accommodate weight of up to 300 pounds. No sand is required to weight these steps down under the water! Intex manufactures this A-frame ladder for their soft-walled pools and it can be used in steel wall above ground pools also. 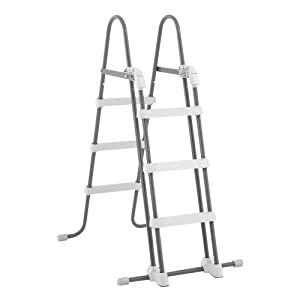 The legs support 4 steps on either side and can be extended out to fully expand the ladder. 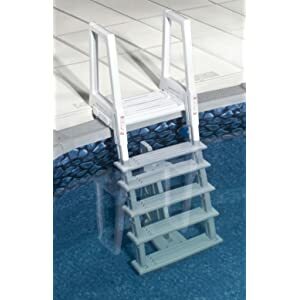 This pool ladder comes with a ladder barrier to block swimmers from getting under or behind the unit and possibly getting caught under the water. This is a great safety feature! This ladder may be used without the barrier, but it is not suggested. Works perfectly with up to a 36 inch Intex or other brand soft-walled pool. People felt the steps were too thin and ladder was fine for children, but wobbly for adults. In-ground pools have built in cascading steps and other ways to get in and out of the water. But an above ground pool needs one of several type of steps or ladders for safe and easy entry and exit. The most used ladder is an A-frame with rungs on the outside and the inside of the pool. Older styles were made of this metal and buckled easily under too much weight. But today's improved A-frame ladders for pools are made of tough plastic and resin and can handle weight of up to 300 pounds. The Confer Plastics A-Frame 7200 Above Ground Adjustable Pool Roll-Guard Safety Ladder and includes a bonus locking feature that prevents small children get into the pool without adult supervision. A-frames can either attach to the pool wall if it is a steel wall or sit over the top rail. In-pool ladders do not have rungs on the outside of the pool and are typically fitted for pools with decks. 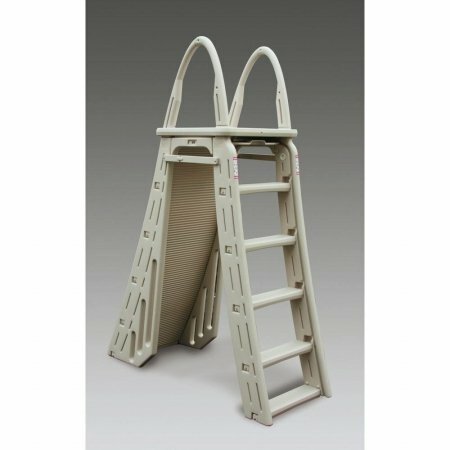 We liked the sturdiness of the Confer Above Ground Swimming Pool In-Pool Ladder Deluxe Pool Ladder, yet another great Confer Plastics product! Pool entry systems that are classified as inside step systems do not have outside steps. Like an in-pool ladder, they are attached to an existing deck or platform. The steps are much wider than a ladder and provide safer use for elderly people, people with limited mobility, and small children who need help getting into the water. These steps are typically more stable also. Typical pool ladders and step systems need to be weighed down by adding sand or pea gravel to the inside of the molded plastic. This eliminates the steps or ladder from floating because of the water. For an easier way to manage the sand or pea gravel, purchase 3" wide PVC pipe; enough to make two lengths of the inside of the ladder rails, and purchase 4 caps for the ends. Fill these with sand or gravel and glue the caps on both ends. Now you can manage the weighted inside without the risk of sand spilling into your water. To keep swimmers happy and safe from injury always make sure the ladder or steps are weighed down sufficiently. Be sure to buy a system that works for the people typically using your pool like small children or people needing assistance to get in and out of the water. 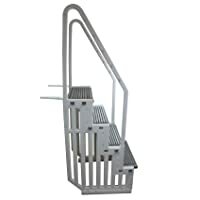 Also, consider the quality and safety features to ensure no accidents occur like the Confer Above Ground Swimming Pool In-Pool Ladder Deluxe Pool Ladder that has an anti-entrapment barrier. A high quality and safe entry to your backyard pool is an important element of summer fun. Don't buy any ladder without reading up on the options and design of the choices available. We've reviewed our top picks so you don't have to search for hours trying to find the best above ground pool ladder. So pick one from our list and let the summer swimming begin!